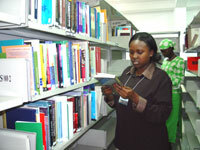 ARSRC's library is a clearinghouse of sexuality resources in Africa. Its collection includes over 1000 gray literature, research findings from work done in the field of sexuality, and gold standard publications. The literature is diverse, sourced from regional and international sources, but with particular emphasis on Africa. The online library provides information similar resources available electronically.